“Oh my god, you started making music to impress girls?” Clara Cappagli asks, turning to bandmate Armand Bultheel. “I was about five and moving house, my sister’s violin hadn’t been packed, and there were two girls (sisters) from the other apartment and so to impress them I took the violin and started playing it. It was horrible,” Armand, now 26, explains on the day we meet at their listening party for their new album ‘The Dog and the Future’, dropping this September. A day that’s weirdly been characterised by dogs. The hotel where we dropped off our bags had life-sized dog statues and posters spread across the reception area and lift. And then when we arrived at Agar Agar‘s listening party we were greeted by a pug waddling through the venue. All before we sat down to talk music and discovered their album name. A coincidence, an omen or the natural alignment of the universe? Who knows. The Parisian duo, who met at the experimental art school Beaux-Arts, have, however, been making music individually long before this. Both started out by “passing through” the Conservatoir, a public music school they enrolled at the age of six: “Tons of kids in France that want to do music have to pass by this institution. It’s really weird, really academic and traditional old ways,” Clara says. Which is at odds with Agar Agar’s instinctual style. “We don’t really have rules. I think that’s the best part of composing. You have to be free with it, you have to have complete freedom of what you want to propose,” Clara explains. And it is this freedom that has allowed the genre-shifting pair to craft a distinct yet undefinable sound; that simultaneously speaks to an international audience through the minimal pop sound of Clara’s sensual lo-fi vocals whilst also retaining their raw independent energy through Armand’s hypnotic layered synth productions that breathe some much needed new life into these oversaturated scenes. 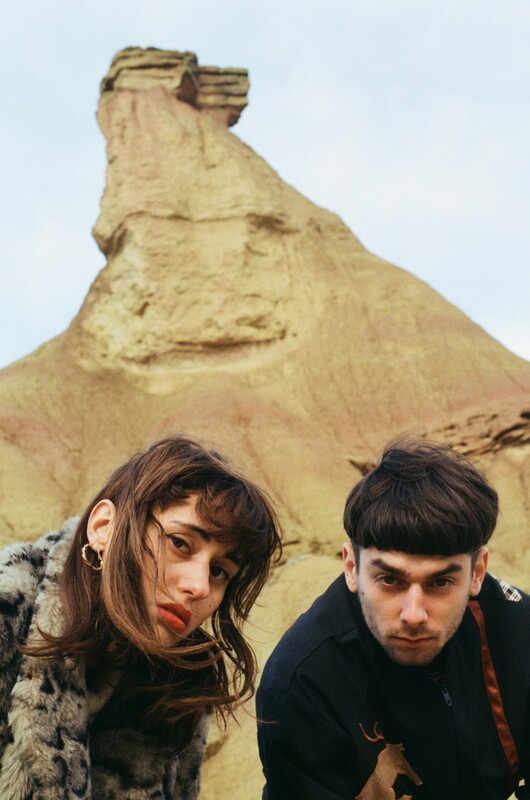 Not only is it good, but their “random instinctive jamming” has resulted in critically acclaimed debut EP ‘Cardan’ in the duos native France,a US and European tour and a new album that’s about to breathe some much needed new life into the oversaturated electro-art pop scene in which they operate. We caught up with the pair to discuss the important stuff: dogs, new music video ‘Sorry about the carpet’ and their art background. Armand, your arm looks pretty injured. What happened? Armand: I twisted falling from skateboarding. But it’s ok because I get the cast off tomorrow. It was like this in the music video. But I didn’t have a cast so I don’t know if you can tell – I don’t move my left arm at all throughout. No, I couldn’t tell. Speaking about the video – what’s the concept behind ‘Sorry about the Carpet’? Clara: We worked with a French art director that’s involved in the cinema scene. He’s original in his way. His movies are really about absurd situations and grotesque scenes. And we didn’t want the video clip to look like a music video, we wanted it to be like an artistic video, a movie. Armand: We wanted it to be thoughtful. Clara: And funny as well. Not super serious, like ‘yo what’s up’ – because it’s the first time we’ve shown our faces. We wouldn’t have ever accepted that if we hadn’t seen what he proposed – he proposed a really funny script. Has your art background influenced the way you make music and your vision? Clara: Yeah for sure. Our artistic inspirations are essential. We control everything, we care about everything. Armand: Evette Atkinson? What’s her name – the French musician? Armand: Atkinson, was it Evette? Armand: Yeah I’m not good with names! Felicia Atkinson– she summed it up perfectly in an interview: ‘the mouth is for talking, the ears are for listening and eyes are for seeing. It’s just about the senses.’ And I think it’s a very obvious thing, but not many people say it. It’s not about different kinds of art, it’s more about senses. Senses are everything. They link you to everything. Like you’re not telling yourself I’m a painter or I’m a musician – you’re just playing with that. And maybe in music, because I’ve been making music for a long time, I can express myself better – but there’s not a reason for me making music more than other stuff. Just using my senses. And why do you sing in English instead of French? Clara: I lived in the US, Wistcontense, when I was 15 and I was already doing music – I was already composing in English. It made sense to me, I felt really related to the language. I don’t know how or why. It spoke to me and it was just obvious to me. So, I started writing, writing and writing and afterwards and it stuck. I like to write in French as well. But with this project, I feel like it suits better to write in English. It would be so different in French. Would you ever do a full French album? Clara: I’m open to it. Even though I love to sing in French, I can do more with my voice in English just because of the sound of the language. Armand: She sometimes uses her voice as a synthesizer. It’s like an instrument. Which she can use much more widely in English. Clara: Yeah there are no walls or barriers in English as well – I’m here to say whatever I think. In French I would probably be like way more ‘uh um err’, blocked by some concepts. It’s the same thing of freedom. I feel free when I don’t think in English. It’s like an instinct thing – the same as dogs having instincts. Speaking of dogs, your new album, ‘The Dog And The Future’ comes out in September – what was the idea behind that, what is the dog and what is the future? Clara: I often feel like I’m a dog and he does as well – we’re dog people. Dogs work with their instincts. And we work that way. When we’re composing we pretty much do things instinctively. It’s kind of ‘go for it’ – with pleasure and everything. And also dogs can be aggressive and angry, they have all sorts of emotions. Armand: That you can read very easily. And the future is this part of the album that we wanted to be more nostalgic. Two of the songs in the future part, we composed them before we started making music together. So it’s kind of like some songs are coming from the past but then some are very new. It’s making the link between our first influences and the music we make now – when we know each other way better. It’s the part of the album which is an opening to something we could do in the future. But also something which we made in the past. Clara: Also there are many songs that talk about video games and how you can stimulate life in virtual reality. We played The Sims all day long when we started composing this part of the album. We started seeing life as virtual. This question arose of what’s real and what’s not. Armand: And the nostalgic part also comes from that because playing the sims is kind of nostalgic, playing a game you played ages ago. And today, the future is being defined by the early science fiction which was written in the early 60s, 70s. They defined things: concepts, ideas that are leading the ways in which we see the future now. That’s the way we construct it, the future and the past are going to be way more linked together. How long has this album been in the works for? Clara: A long time I guess. I mean we composed four songs like three months ago because we had to kinda rush. We got away from Paris. So we rented a house in the South of France in the middle of the woods and we were waking up every day really inspired by the atmosphere and being away. We started drawing and painting, we started doing tons of stuff and we were building our identity. It was really, really essential for us to know what we’re talking about. It was so nice because it really made us grow new stuff that we didn’t even think of before. You’ve recently performed in London and the US before that. What’s been your favourite place to perform? Clara: Maybe Montreal. The crowd was just so into it – there was just a ton of sympathy and love. And after the show, we were backstage in this little room. Just a door separating us from the crowd. They were coming in giving us free drinks and giving us tons of shots. It was crazy but, like, so nice. It was like a party with mates – human to human. Wasn’t just like we’re performers and they’re the audience. It was so authentic and sincere. People from Quebec are really nice. Clara: Not really. We drink. Clara: White wine for sure. Armand: Wine for me as well – red wine. And lastly, what’s your favourite dog? Armand: I’m not a dog racist. I don’t discriminate, we’re against dog racism. Clara: Every dog. What about you? I like pugs, the one that’s been walking around here all day but they have breathing problems don’t they? Clara: Yeah they’re so cute but kind of one of the weaker dogs. Armand: When I was younger I used to be really into big dogs. I used to reject small dogs and then I met the most amazing small dog and yeah I realised that I loved them. Clara: I used to hate Chihuahuas until I met one. Armand: It’s all about the personality of the dog you meet. And obviously dogs are a human creation, they’re a living technology we made. Years ago dogs were useful tools. Like, in Mexico, Chiwawas were used as alarms, and nowadays things have changed, they’re like friends, equal. So we should look at it like when you focus on the personality of that dog whatever the race – what do we find. It sounds crazy, but in a way it’s true.